Could Halloween Face Paint Cause Lifelong Health Problems? For this report, the Campaign for Safe Cosmetics sent popular children’s face paints to an independent laboratory to test them for heavy metals, and we reviewed the labels of cosmetic products at seasonal Halloween stores. Our findings paint a frightful picture: Due to the lack of cosmetic industry regulation in the United States, face paint, hair color and other products on U.S. shelves contain dangerous heavy metals and toxic substances that are banned or restricted in other countries. Disturbingly, parents have no way of knowing what’s really in these products just by reading the labels. 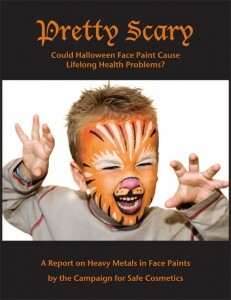 Ten out of 10 face paints tested contained lead.